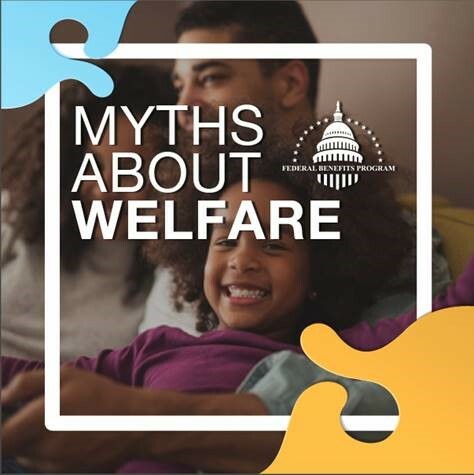 Misconceptions are often the result of misunderstandings and incorrect assumptions, and the many myths about welfare are no different. These phrases have practically become synonymous with “lazy” or “dumb” in today’s society, which is a very unfair stereotype. Rather than simply learning what the most common myths about welfare are, let’s figure out why they are untrue. The most widespread and totally false belief about welfare is that recipients are adults who could get a job, but instead get to stay home and enjoy government checks. Did you know that over half of federal welfare dollars go to benefit adults with disabilities and young children? These are people who legally or physically cannot work. As for those who may be able to work, these “free benefits” often come with very strict requirements regarding employment. Single-parent families receiving TANF (Temporary Assistance for Needy Families) must be working at least 30 hours per week, and two-parent families must work 35 hours per week. To remain eligible for SNAP (Supplemental Nutrition Assistance Program), adults must submit proof of employment or proof that they’re actively searching for employment. 55% of families receiving SNAP are actively earning some type of income. But if so many people receiving assistance have jobs, why do they still need help from the government? Because wages in America are so low that even a full-time position isn’t always enough to live on. 73% of people receiving government benefits are employed, and government assistance isn’t their only source of income. It is a way to help hardworking, taxpaying citizens make ends meet. Another common myth is that payouts from welfare programs are so massive that people will stop all efforts to find employment, and comfortably live off their benefits. The numbers simply do not support this. Supplemental Security Income is a need-based program for those with disabilities that prevent them from working. In 2017, the average individual monthly SSI payout for individuals was just $735 per month. The average SNAP benefit in 2017 was $126 per month per person, which equates to $1.40 per meal. The median TANF Benefit (Temporary Assistance for Needy Families) in 2017 was $432 per family. Try to create a comfortable and enjoyable monthly budget for rent, utilities, transportation, emergency savings, and discretionary spending with only $735 per month. Try to cook a filling and healthy meal for $1.40. This isn’t a luxurious lifestyle that people are choosing to stay on. Every day these programs help millions of Americans survive, but it does not allow them to thrive. When many people think of welfare, they think of the Welfare Queen. This particular myth came about years ago amid reports of large-scale Food Stamp fraud. And back in the 1980s, there was a much higher rate of Food Stamp abuse, particularly in larger cities where people used fake names to collect extra benefits. The massive Food Stamp Reform into today’s Supplemental Nutrition Assistance Program, however, changed the system so that recipients receive preloaded and trackable cards. These cards are much harder to counterfeit and much easier to keep track of than the previous paper stamps. This change decreased the Food Stamp fraud rate from 4 cents on the dollar in 1993 to 1 cent on the dollar as of 2017. So it is fair to say that only small amount of these dollars are potentially lost to fraud, and certainly not enough to justify cutting or ending the programs. SNAP isn’t the only government assistance program with strict standards to avoid misuse of funds. In Mississippi, for example, the average TANF application approval rate is below 2%. Out of 11,700 applicants, only 167 were approved. This is in large part due to the strict eligibility standards that were put in place to prevent fraud. Drug screenings, house visits, check-ins, and recertification of eligibility are just some systems in place to ensure only the genuinely needy families receive the benefits. These myths about welfare are so dangerous because they create a culture in which we judge others without knowing anything about them or their situation. Worse, it could cause someone to avoid seeking the help they need out of embarrassment or pride. Stigmas exist because far too often, people would rather believe rumors than research facts. If we could all take the time to let go of our assumptions and learn the truth of what many Americans are facing, we’ll finally be on the way to real systemicatic and cultural change.